Happy New Year from a (currently) snowy Meadowlands. Looked for the shrike but he may be taking a snow day. This immature Merlin was seen eating brunch along Valley Brook Road in Lyndhurst today, about 50 yards outside DeKorte. 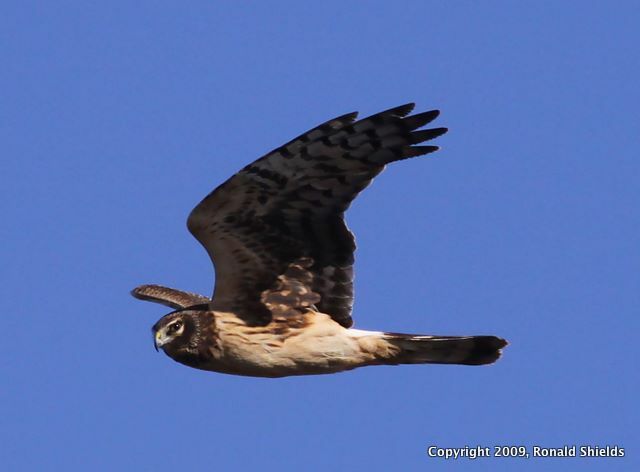 Lots of Northern Harriers and Redtails around as well. 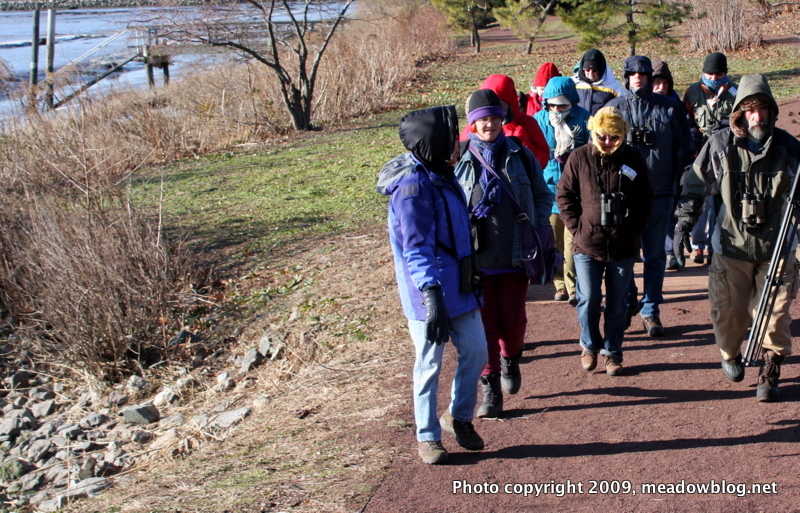 This Sunday at 10 a.m. is the next First-Sunday-of-the-Month Bird Walk with Bergen County Audubon Society. 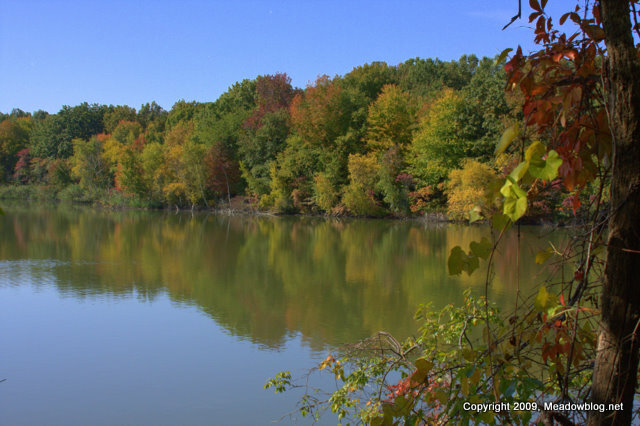 This free two-hour nature walk starts outside the Meadowlands Environment Center in DeKorte Park in Lyndhurst . We’ll walk around the 110-park, looking for wintering waterfowl and other birds, and likely head out Disposal Road to look for the Northern Shrike. To rsvp, contact Don Torino of the BCAS at greatauk4@aol.com. 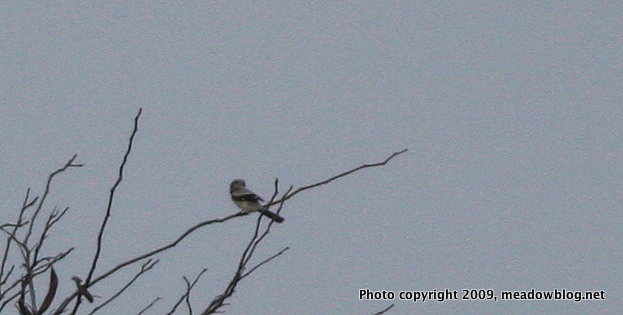 The Northern Shrike continues along Disposal Road. It was spotted around 11:45 a.m. by Jamie Glydon, and also seen by several others. Glydon has tried for 10 years to see the bird in New Jersey, including three hours on Disposal Road in the wind and cold yesterday. Also of note: We are thinking the bird above is a Cackling Goose, seen today in the Saw Mill Tidal Impoundent near the Lyndhurst Nature Preserve in DeKorte Park. Smaller bill, smaller size than the Canada in the background. In the same general area (or beyond): Pintails, Gadwalls, Bufflehead, Common Mergs, Hooded Mergs. Also had a Merlin on Valley Brook just outside DeKorte (thanks, Charley!). Will post a pic later today. To our knowledge, the Northern Shrike has not been seen yesterday or so far today, but we are optimistic. The shrike can be a challenge to see. If you see the shrike (or better yet, take some good shots of it), please e-mail Jim Wright here. The rumors are true: We really did have a bird walk at DeKorte Park today, with nearly 18 undaunted people taking a short trek to look for waterfowl in the few parts of the impoundments that weren't iced up yet. Sightings included more than a dozen Canvasback, three Pintail, 8 Gadwall, multiply Mallards, a Black Duck or two, lots of CAGO and a few Mute Swans. After coffee, cocoa and cookies, we drove out to Disposal Road in hopes of spying the Northern Shrike, but the wind and the cold made it a bit of a masochism clinic. The Northern Shrike was apparently hunkered down somewhere, like most sensible humans. One participant said she was going to the Antarctic next week — seriously. She received a nice dress rehearsal today at DeKorte. Thanks to Don Torino and the great folks at Bergen County Audubon Society for leading the walk, and for all their great work during the year. 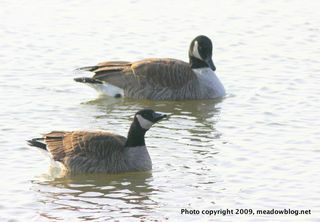 We'd also like to thank everyone who participated in our dozens of programs, events and nature walks throughout 2009. Thank you, and see you in 2010! 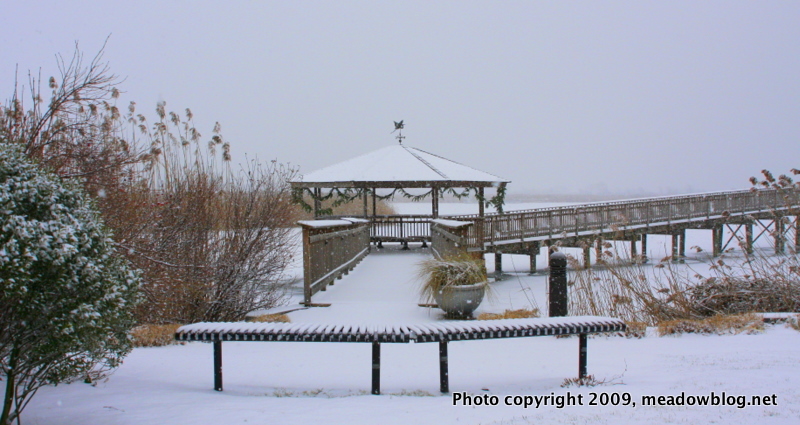 The year 2009 marked the New Jersey Meadowlands Commission's 40th anniversary and a major expansion of our nature programs. We thought we'd celebrate by looking back at 2009, month by month. We are taking a year-end break. Teasers resume in January. Click here for previous Tuesday Teasers. The Northern Shrike has been particularly elusive today. We finally saw him just after 3 p.m., on the far side of the retention pond on Disposal Road. He seemed to wait to appear until two vans with birders in them departed. He then perched in the Black Locust on the top of the landfill (photo above, taken today and posted solely to give you a feel of what to look for), and zipped low again. Let's hope he is more cooperative for tomorrow's walk. Also seen — many N. Harriers, several Redtails, and a Sharpie.